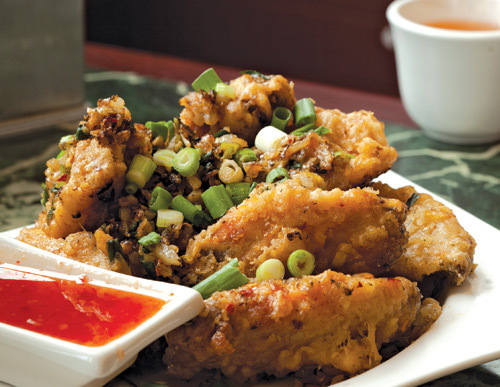 Crunchy, meaty and crusty; these wings are addictive. At Hue Ky Mi Gia, the relatively new, family-owned Chinese noodle shop in the yellow strip mall on Jackson Street, noodles are the star attraction (I like the roasted duck with dry-style noodles). But take a gander at the tables all around the room and you’ll notice there’s one other dish everyone seems to have ordered: the garlic chicken wings. I’m not much for wings in general—I can’t get past the flubby-chubby skin most of them have—so I was skeptical going in for my first bite. But these babies are crunchy, meaty and not fatty, with a flaky crust strewn with bits of salty, garlicky green onion and chile. Be warned: They’re addictive. But you won’t go broke getting a fix; an order of eight is just $7.